The Holderness Family is back. 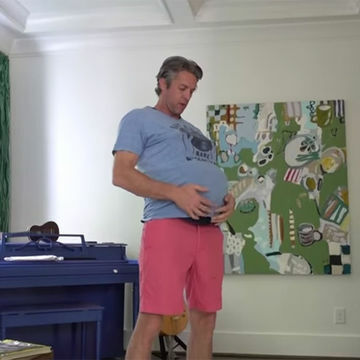 This time with a video of Penn Holderness wearing a 'Pregnancy Simulator.' What a man. Meet Penn Holderness, the man who not only knows what labor feels like, he also knows what it's like to have a baby bump, thanks to his newest experiment. Holderness decided to experience simulated labor as a Mother's Day gift to his wife last year. This year, he opted for something else—he gave himself a big ol' belly. Holderness strapped on an "empathy belly" (yes, it's a real thing), along with a device to stimulate a pregnant women's perpetually full bladder and a series of baby kicks that got him right in the stomach. The verdict? Holderness did not hold up so well under the (literal) weight of this challenge. "This is terrible. I feel warm. I don't like feeling warm. I can't really breathe. There's got to be 40 extra pounds on me," he said at one point. He struggled with finding clothes that would fit his changed body, balance issues, pregnancy brain, carrying his kids over the bump and the all-too-real struggle of untying shoelaces with a baby bump in the way. Did he come out of the experience with a newfound respect for his wife? See for yourself—and don't forget to take in the adorable sight of Holderness's kids laughing at their pregnant daddy.